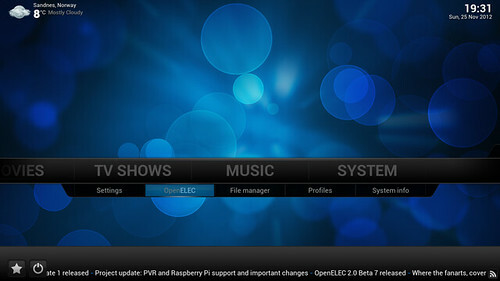 OpenELEC, short for Open Embedded Linux Entertainment Center, is a Linux distribution designed for home theater PCs. Using XBMC but unlike XMBC, which is a standalone software, OpenELEC is a small Linux distribution built from scratch as a platform to turn your computer into an XBMC media center. OpenELEC is specially designed to be small and fast (either from system boot up or loading movies). It is also easy to install, so that you can easily turn a blank PC into a media machine in less than 15 minutes. It supports almost any x86 Pentium 4 or later. It is also also has optimized builds for certain platforms including NVIDIA ION and ION2, Intel GMA HD chipsets, AMD Fusion, Apple TV 1 (using Broadcom Crystal HD) and Raspberry Pi. OpenELEC is free for download. Make sure you choose the correct builds before download. Visit OpenELEC download page.